This photograph shows inmates James Pabst, prisoner number 9606, and Steve Elliott, prisoner number 9043. 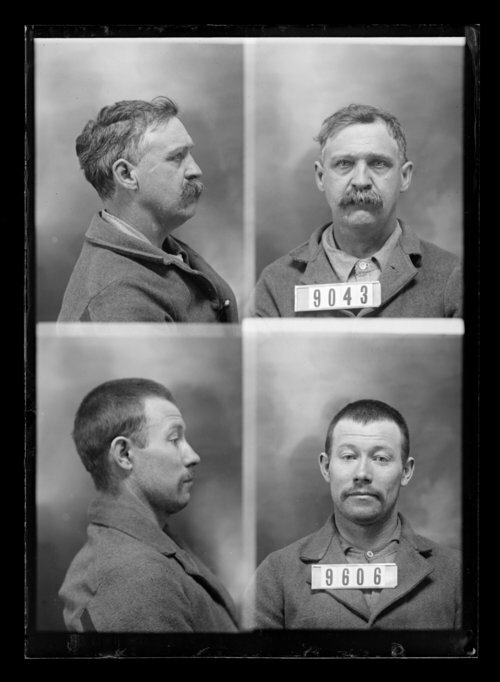 James Pabst, also known as Joe Pabst, was received at the Kansas State Penitentiary on December 12, 1900 from Cowley County, Kansas for grand larceny. He was sentenced on December 6, 1900 and recaptured after escape. Inmate Steve Elliott was received at the penitentiary on October 12, 1899 from Wilson County, Kansas for disposing of mortgaged property.